Black panther is the name given to several different species of large cats, most notably jaguars and leopards. 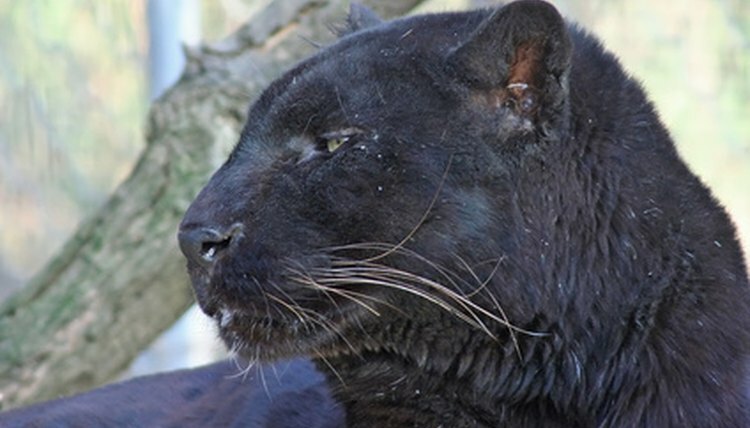 Black panthers are melanistic, meaning they have an increased amount of dark pigmentation. As with most animals, there are notable differences between the genders in black panthers. Male jaguars are slightly larger than females. Male black leopards are around 30 percent larger than their female counterparts, as well as considerably heavier. Male jaguars reach sexual maturity at 40 months, while the females do so much earlier at 18 months. Female leopards reach maturity at around two years, while males are capable of breeding at the same time. Because of competition from older males, however, most males do not breed until they are three or four years old. The female black jaguar looks after her cubs for one to two years, and the male does not help raise the cubs. The female black leopard looks after the cubs for between 18 and 24 months. Once again, the male takes no part in raising the cubs. Male leopards and jaguars roam a large territory, which they mark out as their own with urine and feces. A typical male black panther's territory can range between approximately 18 and 46 square miles, whereas a typical female territory has a range of around 9 to 10 square miles.